The UAM2 kit uses the latest amplifier technology to bring you a clear, crisp, high-power audio without any of the heat which is normally generated with traditional amplifier circuits. 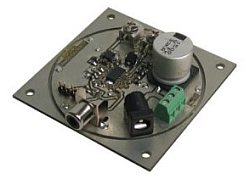 It uses a small surface mount (SMD) class-D amplifier IC, which can deliver a full 20 watts of power output (when using 18V power supply) without getting hot. You can install this amplifier right inside your speaker enclosures, or wherever this small kit will fit. There are four gain settings giving you a rough volume adjust, and also a shutdown input so you can turn the amplifier off without disconnecting the power. Remember that this is a Surface Mount (SMT) kit, so you will need fine tweezers, a magnifier and a decent fine tip soldering iron for assembly. The 24 pin TPA3001D1 amplifier is soldered onto the board, but all the other parts are left for you to solder. If you have some surface mount experience, it should be really easy. TDA2040, TDA1013B, TDA2005, LM386 and TDA2003.